Commissioner Debbie Lieberman is at the forefront of a campaign to provide universal access to high-quality preschool in Montgomery County, Ohio. 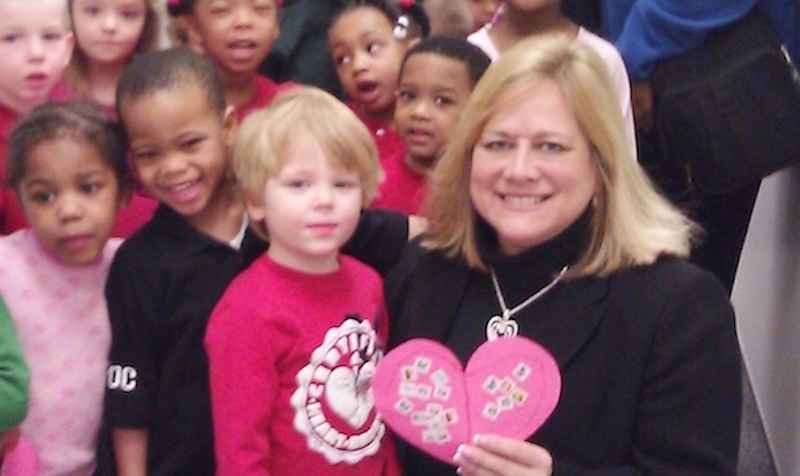 Debbie Lieberman understands the positive power of preschool. Her sons, David and D.J., now students at Ohio’s Miami University, attended a preschool program at a Jewish community center in Dayton. The program’s director, Lynda Cohen, was known throughout the community as a champion of high-quality early learning. Cohen filled her classrooms with a diverse mix of kids representing many races, religious backgrounds and family incomes. David and D.J. and their preschool classmates were lucky. Then as now, significant numbers of children in Dayton and surrounding Montgomery County start kindergarten without the skills they need to succeed in school and in life. Today, fewer than two out of five students in the county are fully ready for kindergarten as measured by the state’s readiness test. 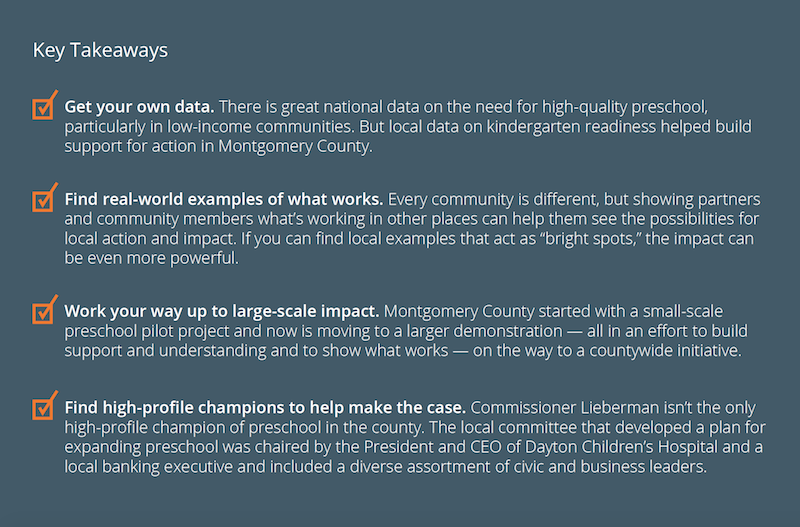 Alarmed by the data — and knowing how her own children benefited from high-quality early learning — Debbie Lieberman is following Cohen’s example as Montgomery County’s preeminent proponent of preschool. 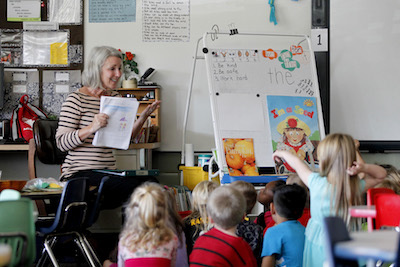 From her influential position in county government, she is leading the charge for a collaborative, data-driven effort to double the number of county children attending high-quality preschool in the next 10 years. The research could not be clearer: high-quality preschool provides a critical foundation for student success. Study after study shows that quality preschool leads to dramatic gains in kindergarten readiness, third-grade reading and other positive student outcomes. It was this kind of data that spurred a group of Montgomery County leaders and parents to come together in 2007 to explore how to increase the number of county children in quality preschool programs. With start-up support from the Montgomery County Family and Children First Council and The Frank M. Tait Foundation in Dayton, the group formed ReadySetSoar, an initiative to improve kindergarten readiness and third-grade reading proficiency among local youth. ReadySetSoar is an initiative of Learn to Earn Dayton, a cradle-to-career partnership focused on ensuring that students in the region succeed in school, college and beyond. From the outset, ReadySetSoar worked to gather its own data on the need for quality preschool in Montgomery County through parent surveys and partnerships with University of Dayton researchers. Among the findings: county children from low-income families who attended high-quality preschool scored 2 to 3 points higher on Ohio’s 29-point kindergarten readiness scale than peers who did not attend preschool. 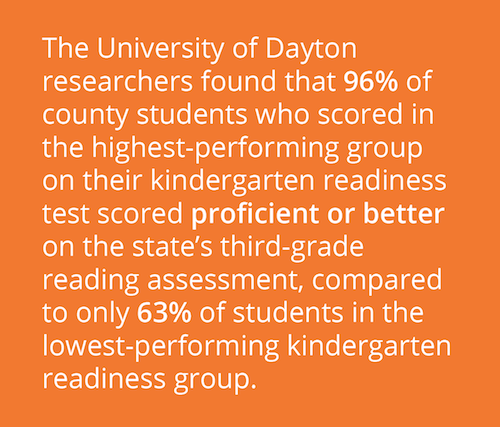 To show that these benefits carry on as children progress through school, the University of Dayton researchers found that 96 percent of county students who scored in the highest-performing group on their kindergarten readiness test scored proficient or better on the state’s third-grade reading assessment, compared to only 63 percent of students in the lowest-performing kindergarten readiness group. Before long, ReadySetSoar hatched a small pilot project to increase the number of low- and middle-income students enrolled in preschool in the Dayton suburb of Kettering. “We wanted to figure out what works to expand access to preschool for local families,” said ReadySetSoar Director Robyn Lightcap of the pilot, which offered tuition assistance for students based on their family income. Today, with the Kettering pilot wrapping up its second year, ReadySetSoar and its local partners are moving forward with a plan for a larger demonstration project aimed at expanding access to affordable, high-quality preschool for between 600 and 800 students in Kettering and northwest Dayton. Among the local partners playing a critical role in the demonstration project is the Montgomery County Commission. Using funds from a voter-approved levy for human services, the county is providing $1.4 million toward the $2.7 million cost of the effort. Other funders include the city of Dayton, the school district and local foundations. 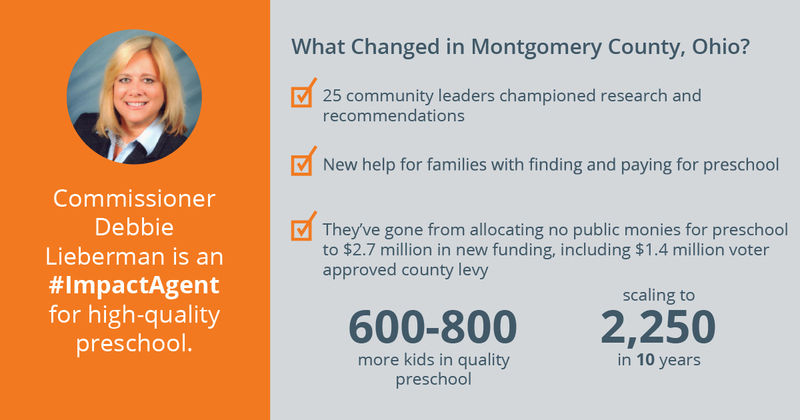 Montgomery County has a tradition of commission members becoming champions for specific issues that can be supported with the county’s human services levy. As ReadySetSoar and its local partners began exploring how to expand high-quality early learning in the county a few years back, Lieberman stepped up to become the champion for the cause. Lieberman dug into the research on the payoffs of quality preschool, and she traveled with Lightcap and other local partners to Denver to see firsthand how it moved forward with plans for universal preschool. She was the key force in asking a committee of 25 civic leaders and community members to investigate how Montgomery County could pursue a significant expansion of preschool. After the committee issued its recommendations to the county commission in November 2015, Lieberman and her two colleagues voted unanimously to move forward with the demonstration project and approve the county’s contribution. As a result of Lieberman’s hard work and advocacy, a county that 10 years ago spent no public monies on preschool now is putting a stake in the ground and investing real resources behind a plan aimed at increasing access to high-quality early learning. “In the end, it wasn’t really a tough sell with the commission because the recommendations and the plan are so data-driven and are based on evidence of what works,” said Lieberman. The demonstration project will further expand access to quality preschool in suburban Kettering and a lower-income community in Dayton. The effort is focused on three “pillars of success” that emerged from the work of the 25-member committee that recommended the expansion: educating the community about the power of preschool; expanding the availability of high-quality preschools; and assisting families in finding and paying for preschool. In the course of the two year-initiative, ReadySetSoar and its local partners hope to learn more about what works in each of these three areas. As they prepare to launch the demonstration project, Lieberman and ReadySetSoar still have their eyes on the prize of “preschool for all,” which they hope to start implementing throughout the county in 2018. Lieberman is in regular conversations with her colleagues on the commission, as well as other local leaders, about raising the resources from the county and other donors to achieve the goal spelled out in the steering committee report: increasing the proportion of children in the county who attend a high-quality preschool in the next 10 years from 35 percent to 70 percent. This would mean moving about 2,250 four-year-olds into high-quality programs. ReadySetSoar is an initiative of Learn to Earn Dayton. Together, these two public-private partnerships are working to ensure that every young person in the Dayton region is ready to learn by kindergarten and ready to earn upon graduation after getting a college degree or post-high-school certificate. Learn to Earn Dayton is a Sustaining member of the StriveTogether Cradle to Career Network.